Looking up at Ha Ling, Mt. Lawrence Grassi and the Ship's Prow from the Dog Park at Quarry Lake - aka the LZ. The shoulder season is a mellow time of year in Canmore. The days are short, the mornings are cold, and the weather is always a dog's breakfast. I was hoping to have a productive hike and fly season this fall, but the high winds have contributed to as much walking down as flying. On the rare occassion that I have gotten in the air, I've been reminded of how amazing it is to fly amongst the local peaks. 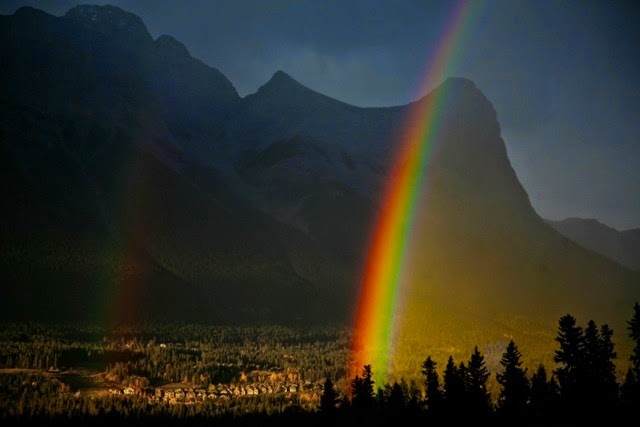 An amazing photo by Gery Unterasinger with the rainbow slicing right through Ha Ling. 1) Really nice leading edge with rods and mylar re-inforcing each cell. This is very confidence inspiring! 2) Risers are thinner and more user friendly than the original wing. 3) Felt very smooth, responsive and predictable in flight. 4) Noticeably slower to come up over head on launch than lighter weight wings. Hi, I was just wondering what your wing loading was on the firefly 2? I'm hoping to do some foot launches around the Canmore area and am debating getting a larger wing for the more complex terrain. My all-up weight is about 78 kgs on the FF2. Without any lift and calm wind, this gets me from Ha-Ling to the dog park (via whitemans gap) with not much altitude to burn.